In November 2018 Rosa Vicari defended her PhD thesis on the topic Digital traces of climate related risks: measuring the communication impact of Paris resilience strategy supervised by Daniel Schertzer and involving as jury members: Roberto Grandi (referee), Bologna University; Marie Claire ten Veldhuis (referee), Delft University of Technology; David Chavalarias, CNRS – Institut de Systèmes Complexes IdF; Massimino Bucci, Trento University; Dimitri Solomatine, Unesco-IHE; Ioulia Tchiguirinskaia, ENPC). 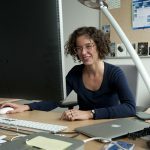 During her PhD research (2016-2018), Rosa’s scientific interests mainly concerned digital media, e-government, evaluating the impact of science outreach on urban resilience, urban resilience metrics, big data exploration techniques, advanced text mining, network representation. Her PhD research was sponsored by the Chair Hydrology for Resilient Cities funded by Veolia at École des Ponts ParisTech. 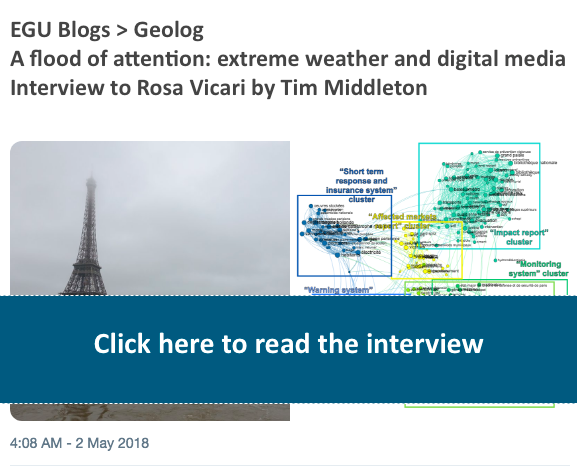 Rosa Vicari arrived to École des Ponts ParisTech in November 2012, as the communication officer within the European Interreg NWE project RainGain (2011-2015) on the use of high resolution weather radars to reduce the risks of pluvial floods in urban areas. Her work also contributed to the related regional project RadX@IdF and to the European Climate KIC Blue Green Dream project aimed to optimise synergies between green infrastructures and water management. Graduated with a Master degree in public, political and social communication, she studied at the University of Bologna, the University of Montreal and the Chelsea College in London. After several years of collaboration with an Italian television broadcaster (TV2000), Rosa Vicari specialised in environmental communication, with two years of activity in the field of consulting on sustainable development projects. Rosa Vicari, Ioulia Tchiguirinskaia, Daniel Schertzer, State of the Field of Social Impact Assessment under the Paris-R100 projection (2016). Chair Hydrology for Resilient Cities supported by Veolia, 107 pp. Rosa Vicari, Ioulia Tchiguirinskaia, Daniel Schertzer, Review of alternative approaches to assess resilience to extreme weather (2015). Chair Hydrology for Resilient Cities supported by Veolia, 50 pp.